Home|News & Blog|Is There a Deadline for Me to File an Appeal of a Judgment? How long can I take to appeal a final judgment? This is a very good question. If you are appealing too late, then the Court of Appeals will not have jurisdiction to hear the case. As a general rule, the Texas rules of appellate procedure require a notice of appeal to be filed within 30 days of a final judgment signed by the judge. However, that time is extended to 90 days of the judge signing the final judgment if a timely motion for new trial is filed. The timely motion for new trial would have to be filed within 30 days of the judge signing the judgment. Of course, there are some exceptions to this rule, and an extension of the time to file an appeal is possible. But generally, that will be only a 15-day extension. So many times if the final order is months or years old, and appeal will not be a good remedy, but possibly some other remedy may apply. Also during a case before the final judgment, it may be possible to file an emergency type appeal with the Court of Appeals called a mandamus. There is technically no time limit on a mandamus as there has not been a final judgment at that point. So of course timeliness is important and getting ahead of the game when you’re anticipating filing an appeal. If you wait too long, the time to appeal can go away. 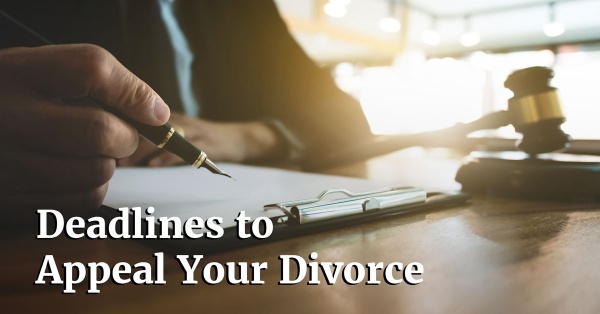 Read more about appealing a divorce decree or judgment.